Parking.com has convenient parking near Old Sacramento. Refer to the map for more information on nearby parking locations. 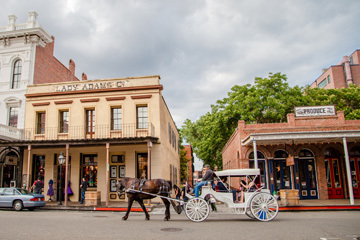 Old Sacramento Historic Park is an outdoor living history center comprised of 53 historic buildings dating back to the 19th century. Located between the river frontage and Interstate 5, the district attracts over 5 million visitors annually. Regular events include the Sacramento Music Festival, Gold Rush Days, New Years Eve events, St. Patrick's Day Parade, World Music and Dance Festival, and Mardi Gras.